Inspiration begets inspiration, especially in the arts. That’s Ryan Honey’s contention, and it has served him well in his stewardship of The Arts Campus at Willits (TACAW). In his first year as executive director, he’s facilitated partnerships with more than 30 other nonprofits in the area. Now, on Friday, Dec. 7, he’ll see a new one come to fruition with the Art Base. 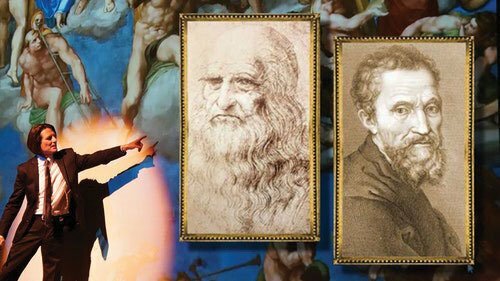 That changed when a contact from the Front Range suggested that Honey consider a multimedia theatrical performance that explores the Italian Renaissance through the perspectives of Leonardo Da Vinci and Michelangelo. “We do theater and we do lectures, and this piece is a cool combination of the two,” Honey said. “So we looked into it.” In addition to film and machinery (Da Vinci is a long-revered inventor as well as artist), the piece features sketches, paintings and sculpture. Finally, Honey had a show with a visual arts theme to pitch to the Art Base. Art Base Executive Director Genna Moe — who is currently on maternity leave — and interim Executive Director Skye Skinner didn’t hesitate to pursue the idea. That last point is particularly exciting, both Honey and Skinner agree. That’s a good thing for everyone, he continued. Skinner, too, feels that Basalt is having a moment. There is a lot to celebrate — and a lot of work to continue, she observed. When: Friday, Dec. 7 at 8 p.m., doors at 7:30 p.m.